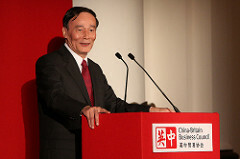 China’s former anti-graft czar Wang Qishan blames separation of party and government for undermining CCP leadership. Wang Qishan, who recently stepped down from the position of China’s anti-graft chief, has been long regarded as one of the most important allies and loyal followers of Chinese President Xi Jinping. Although it’s still uncertain whether Wang will assume another position in the government in the following years, his prestige within the Chinese Communist Party (CCP) and even across the country is unquestionable. His words and speeches have always been carefully scrutinized by China analysts for indications of CCP policy and Xi’s vision. On November 11, China’s state newspaper People’s Daily published a more than 5,000 word article by Wang in the important news section. In the article, Wang discussed at length the CCP’s rule of China and its future policy under the leadership of Xi. Specifically, he reaffirmed the problems of the idea of separation of party and government, blaming it for undermining the leadership of the CCP. As The Diplomat reported earlier, the CCP added “Party, government, military, civilian, and academic, east, west, south, north, and center, the party leads everything” — the phrase coined by Mao Zedong during the period of the Cultural Revolution — into the Party Constitution after the 19th Party Congress. For a certain period of time, some people have kept silent or ambiguous about the issue [the absolute leadership of the Party] and practiced the separation of Party and government without any precondition, which resulted in the weakened leadership of the Party. General Secretary Xi Jinping has always been full of confidence in upholding and strengthening the Party’s leadership … The essence of his series of important speeches is all about upholding the Party’s leadership… [He has] clarified the blurry understanding, regained the lost battlefield, straightened out the awry road, established the authority of the Party, and fundamentally changed the situation of a weakened Party’s leadership. “We must take a clear position and be straightforward on this issue,” he added. In recent years, more and more CCP organs have started to function as the government’s organs. The phenomenon of “one institution bearing two names” — which was common before the Deng era — has become popular again in China. For example, China’s top internet censor, the Cyberspace Administration of China (CAC), founded in 2014 after Xi came into office, is supposed to function as a government organ, but it also works as a Party organ under the name of the Office of the Central Leading Group for Cyberspace Affairs.